Miasmata is a unique survival adventure that has you attempting to cure yourself from a deadly disease. The only thing you have at your disposal is your scientific knowledge and the plant life around the island. Miasmata is one of the most unique and impressive adventure games released in recent years and is even more impressive when you discover the game was created by two brothers (the production quality definitely rivals that of a larger team). Not only are the environments visually attractive but small details like the sound changing based on the terrain you are walking, animals that react to you and the realistic inventory add a lot to the experience. 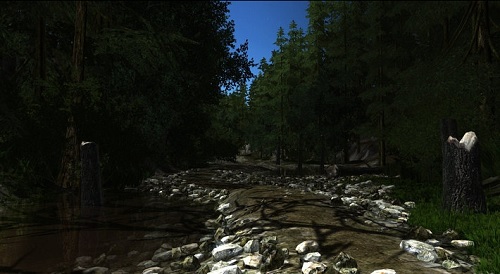 Miasmata combines elements from a number of genres mixing first person survival with puzzle elements. 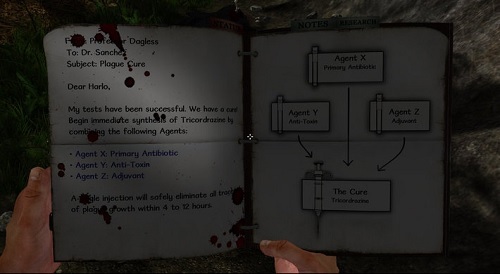 In the game you play as Robert Hughes, a plague infected scientist who finds himself on an uninhabited island. The island wasn’t always this way though with old monuments scattering the landscape and the odd dead body for the player to find. The cure is hidden in the plants on the island which you’ll have to collect and study. By using the research outposts spread across the island players can save up to 6 specimens (shared between all outposts for convenience), study a specimen to discover its properties or synthetise plants together to create tonics. These tonics not only help to hold off the disease and its symptoms but can also be used to increase your endurance, strength and perception which will help you survive and make your adventure easier. The disease isn’t the only threat on the island though, players will also to keep their hydration up and have to avoid a strange beast that loves to stalk you as you explore the island. Miasmata delivers a great atmosphere with unique gameplay that is easy to get hooked on. Focus on realism creates a great game atmosphere. Find the cure by collecting plants and mixing them together. Fight off dehydration and watch out for the large tiger like animal.